. 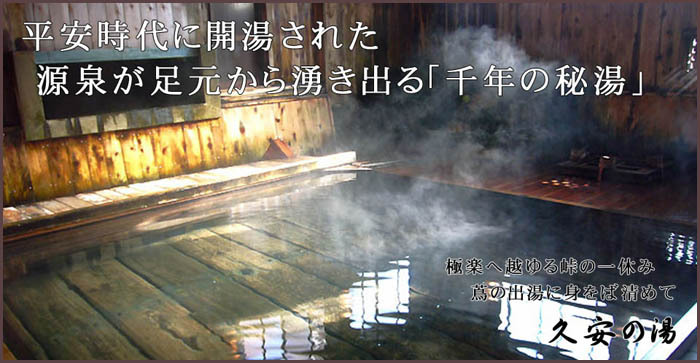 Legends about Onsen Hot Springs　温泉と伝説 . 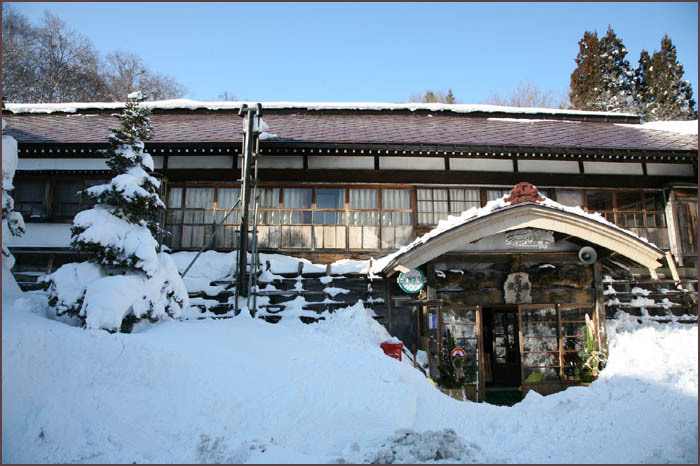 and is regarded as being one of the “Top Three Hot Springs” in Japan along with Arima and Kusatsu Onsen. From ancient days Gero Hot Springs were familiar to people for its bountifulness. One day the springs had been stopped because of a big earthquake. People were so sad. One day one egret swooped down on the Masuda River and stood for awhile. And the very next day he came the same place and stood there. Day after day he did the same thing! They wondered why, but look! There is a spring! They were so glad. The egret left the place and never came back again. They noticed that there was a statue of Yakushi-Nyorai. So they appreciate that the egret was the embodiment of Yakushi-Nyorai, who was pity for them and tell them the source of the Hot Springs. gero gero is the sound of a frog. 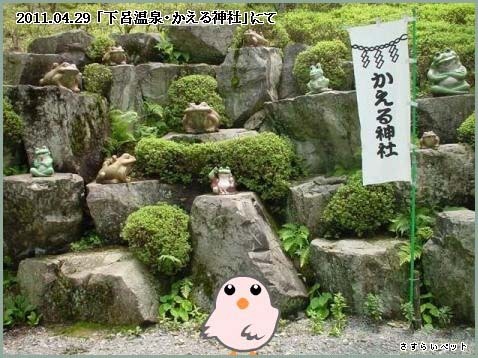 Therefore there are many items related to frogs in Gero town.
. kaeru カエル　蛙　お守り　Frog Amulet - Frosch . 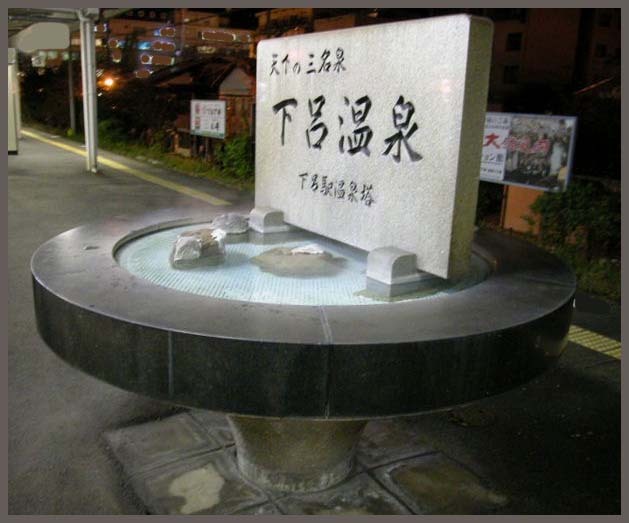 A well-known Japanese legend originated from the Gero Hot Springs District. 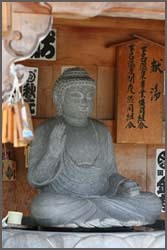 In the Onsen-ji Temple, Bhaisajyaguru Yakushi Nyorai is enshrined, the Buddha of healing who is mentioned in legend. At the top of 173 stone steps, there is the main building of the temple. From the temple gate, you can enjoy sweeping views of the hot springs town and the Hida River. the Buddha of Medicine and Healing . photo : wikipedia - CLICK for more photos ! This Zen temple was founded to enshrine Kuan-shih Yin, in the Kamakura Period (1185-1333) on the site where a high priest named Soto Keishin had built a hermitage during the Heian Period (794-1185). Emperor Gonara designated this temple as one of the top ten temples of the nation, and ordered the temple to be a place of prayer. The garden created by Sowa Kanamori and “a large image of Bodhidharm” painted by Sesshu are worth seeing. Once 狩野法眼 Kano Hogen painted an ema votive tablet of a horse. But the horse left the plate every night and devastated the fields. So eventually he painted some golden braidle to keep it in place.
. Kano Eitoku 狩野 永徳 .
. Kano Motonobu 狩野元信 Kanō Motonobu . with more legends about his ema animal paintings.
. Hidari Jingoroo 左甚五郎 Hidari Jingoro carpenter . In a cave lived a Hihi and asked for a village girl as an offering every year. Once 悪源太義平 Akugenta Yoshihira (Minamoto no Yoshihira 源義平 (1141 - 1160) disguised himself as a girl and fought the monster with his sword 祖師野丸 Soshino Maru. Later an officer from the a village nearby tried to steal this sword, but there was a flash of light from the house and everything began to move violently. Yoshihira was a Minamoto clan warrior who fought alongside his father, Minamoto no Yoshitomo, in the Heiji Rebellion. His brothers were Minamoto no Yoshitsune, Noriyori and Yoritomo.
. Hihi (狒々, 狒狒. 比々) Baboon Monkey Monster . This shrine is related to the legend. Once 難波三郎經房 Naniwa Saburo Tsunefusa had a dream where Akutgenta became a thunder. 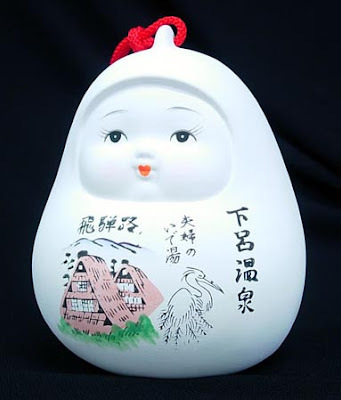 On the next day, when Tsunefusa was with Kiyomori Nyudo it suddenly became cloudy and thunder rolled along. When he saw this he drew his sword and tried to hit a thunder cloud. Soon it was fine weather again. His sword had a mark of burning.
. gaaranbe ガーランベ Kappa . There was a family of doctors in Gero in the third generation. The first generation doctor once went to the forest, where he helped a fox that had hurt his leg when falling on a stone. He carried the fox home and treated the would carefully. Then he let the fox go back to the forest. To show his gratitude, the fox taught the doctor how to heal a broken bone. Therefore the family of this doctor is prosperous to our day.
. Legends about kitsune 狐 The fox . Once the Koshin Deity came down to earth. But with its three eyes and wild face, nobody dared to come out and greet him. Only a turtle 亀　came out to meet him.
. The Koshin Cult (kooshin 庚申, ka no e saru) . tsuchihebi, tsuchi hebi ツチヘビ is another name for nozuchi 野槌, a huge snake with almost no head or tail, looking like a huge hammer. This snake lives in the high mountain and sometimes comes rolling down noisily to the village to catch a human for food. Once there was a fire near the forest office on mount 七宗山 Hichisozan. A huge serpent was fleeting along the road hastily and the weeds on the roadside were moving like waves. The remains of this descent are to bee seen still.
. tsuchinoko ツチノコ or 槌の子 "hammerspawn" snake .
. - daija, orochi 大蛇 the huge serpent, great snake legends - . when people were on their way home from working in the mountain forest, a wolf would follow them. The wolf had smelled the salty miso paste of their lunch and wanted some salt. This is the "wolf sending off workers". an old woman helped a wolf, who had a bone of a wild boar stuck in his mouth. Next morning she found a chain of gold 金の鎖 on her doorstep. a man helped a wolf, who had a bone stuck in his mouth. A few days later (next morning in other versions) he found a scroll on his doorstep, explaining the techniques of bone medicine. This was an act of gratitude by the wolf. 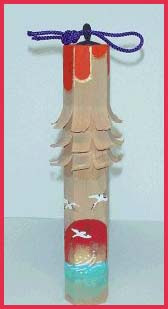 (Similar to the kitsune fox above). 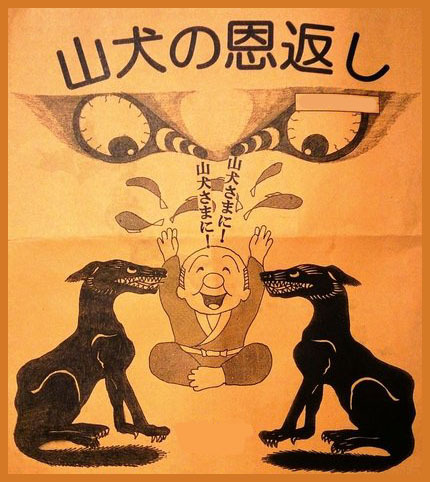 The man became a doctor and specialised in healing bones.
. ookami 狼 yama-inu 山犬 wolf legends .
. Clay Bells どれい【土鈴】 dorei . Tsuta Hot Spring is a lone "secret hot spring" in the 奥瀬 Oirase woods of Aomori. kyuuan 久安 Kyuan, from 1145.7.22 - 1151.1.26 in the Heian period. 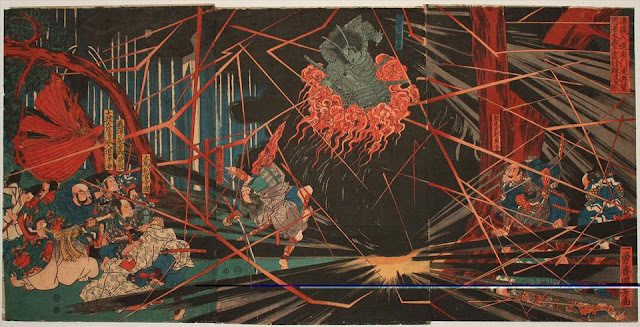 The time of Emperor Konoe 近衛天皇. Tsuta Onsen is nestled deep in the southern part of the Hakkoda Mountains in Aomori Prefecture, embraced in the stillness of a Japanese beech forest. Here, time in the forest passes slowly and serenely. Time for a beech seedling to grow into a tree and for the tree to finally return to the earth. Time for the rich forest to offer a rich source of water. Time for the wet marshland to turn into a soft forest bed. One minute in the city passes differently from a minute in a hot spring inn in the forest. For now, turn away from the rush of daily life and enjoy the slow passage of time in the forest. Mentioned in the literature as a small hut where people come to heal their illness. It is "a place where tsuta grows in abundance. This bath was renovated in 1990. In the olden days, the large baths at Japanese inns were used by both men and women at the same time. Now men and women take a bath at different times. This bath is popular for its cozy and traditional atmosphere. In the wash area is a tank in which freshwater fish of the area swim. In the morning and after 9 in the evening for women. From 13:00 to 20:00 by men. was the 76th emperor of Japan, according to the traditional order of succession. Konoe's reign spanned the years from 1142 through 1155. Konoe was named heir shortly after he was born in 1139; and he was proclaimed emperor at the age of 3. 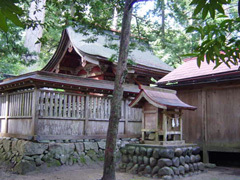 During Konoe's reign, the Enshō (Superiority of Duration) Temple was built. After this, successive emperors no longer build Imperial-prayer temples. Emperor Konoe's reign lasted for 13 years: 2 years in the nengō Kōji, 1 year in Ten'yō, 6 years in Kyūan, 3 years in Ninpei, and 2 years in Kyūju. The years of Konoe's reign are more specifically identified by more than one era name or nengō. Kyūan 1, in the 8th month (1145): The mother of former Emperor Sutoku (also known as "Taikenmon-In") died. Kyūan 2, in the 2nd month (1146), Konoe visited Toba-no-Hōō. Kyūan 2, in the 12th month (1146), Konoe joined in a celebration honoring Sesshō Fujiwara no Tadamichi (the regent) on his 58th birthday. This event was important because, in each sexagenary cycle, the first and the fifty-eighth years were considered to be auspicious according to Chinese astrological principles. Kyūan 4, in the 6th month (1148: The imperial palace was consumed by flames. Kyūan 6, in the 1st month (1150): Konoe assumed the role of a mature adult; and he married Fujiwara-no Tokoku, who had been raised by Sadaijin Yorinaga. 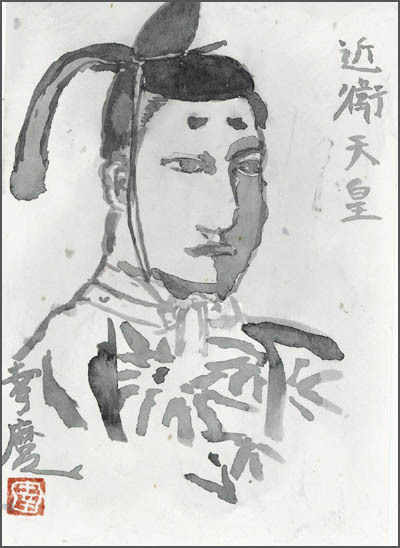 Tokoku was the daughter of Dainagon Taira-no Kiyomori. This bride became Kōkōgō (皇皇后) or first empress. Kyūan 6, in the 3rd month (1150): Konoe married again, this time to "Feï-si," who had been raised by Sesshō Fujiwara-no Tadamichi. She was the daughter of Dainagon Fujiwara-no Koremichi. This bride became Chūgū (中宮) or second empress. Konoe was so very much enamoured of this second wife that he neglected his first wife, which caused discord in the kugyō, especially between Tadamichi and Yorinaga. Kyūan 6, in the 12th month (1150): Sesshō Minamoto-no Tadamichi, resigns his position and is named Daijō Daijin. 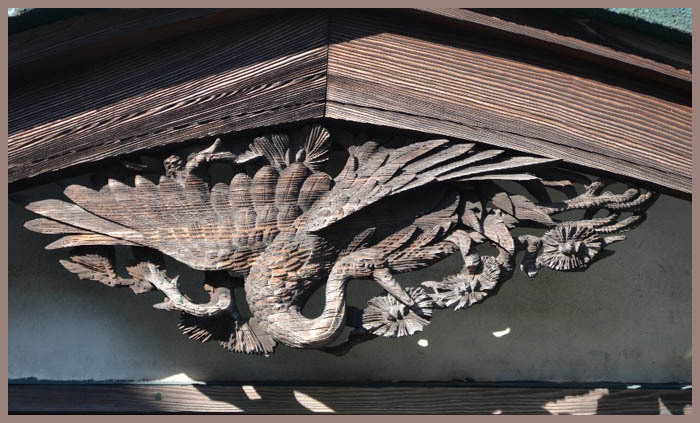 In this same month, Minamoto-no Yoshikane became head of the Ashikaga clan in Shimotsuke province.
. 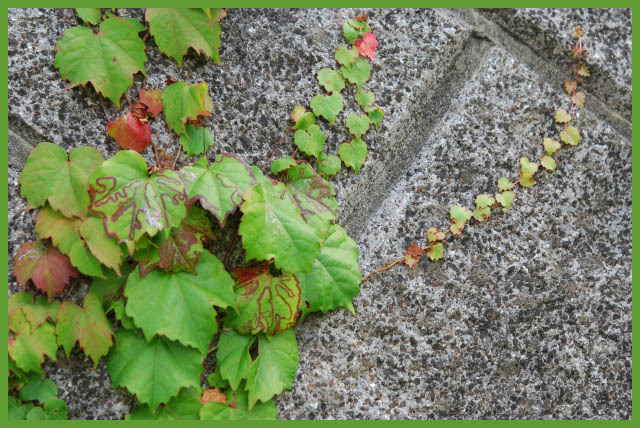 Eight famous old Hot Springs 八古湯 since the Heian Period .
. tsuta 蔦 (つた) Japanese ivy .